page from Volume 2 of the three volume set The Science of Life by H. G. Wells, Julian Huxley and G. P. Wells (1929-39). The Mollusks are a large and diverse group of soft-bodied unsegmented animals. Nearly 130,000 recent species are known, and some 35,000 fossil species. They include many familiar animals, like snails, clams, squid, octopi, etc, as well as others not so well known. They range in size from microscopic forms to the giant squid (Architeuthis), and have a long and venerable history appearing during earliest Cambrian time, if not before. a shell made of calcium carbonate. This fossilizes easily, which explains the rich fossils record the mollusks possess. Although not all mollusks share all these characteristics, generally all mollusks have at least some of them. Despite sharing these common features, the mollusks are an incredibly diverse group. The following diagram shows the major classes, which as can be seen are all based on variation in this same body plan. 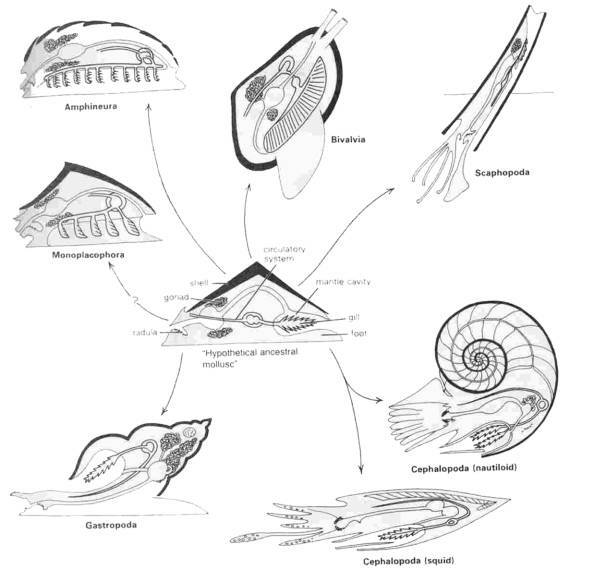 This diagram presents a stylized relationship between the different Molluscan groups, with all evolving from a "hypothetical ancestral mollusk". It is now known that molluscan phylogeny is a lot more complex than this. When Linnaeus was formulating his system of binomial nomenclature the mollusks were grouped (along with most invertebrates) under vermes, worms. The name Mollusca (from the Latin mollis "soft"), was first used by the great French zoologist Cuvier in 1798 to refer to cephalopods like squids and cuttlefish. It was later extended to include other organisms of this group, such as snails and bivalves. The Devonian saw bivalves invade freshwater, and the first land snails appeared during the Carboniferous. During the Devonian also, the ammoniod took over from the nautiloids as the dominant cephalopod group, and these creatures continued to flourish throughout the entire Mesozoic, living alongside species of bivalves and gastropods not very different to modern forms. (Oysters for example were common during the Jurassic and Cretaceous, while scallops date back to the Paleozoic). By mid Cretaceous most mollusks, like most invertebrates and fish, were essentially like modern forms, except for the Cephalopods which were still represented largely by the Mesozoic ammonites and belemnites. The ammonites were decimated by the K-T extinction event, as were the reef-building rudist bivalves (although these were on the decline for some time), but the coleoids (soft-bodied squids, octopi etc) continued to evolve quite happily. 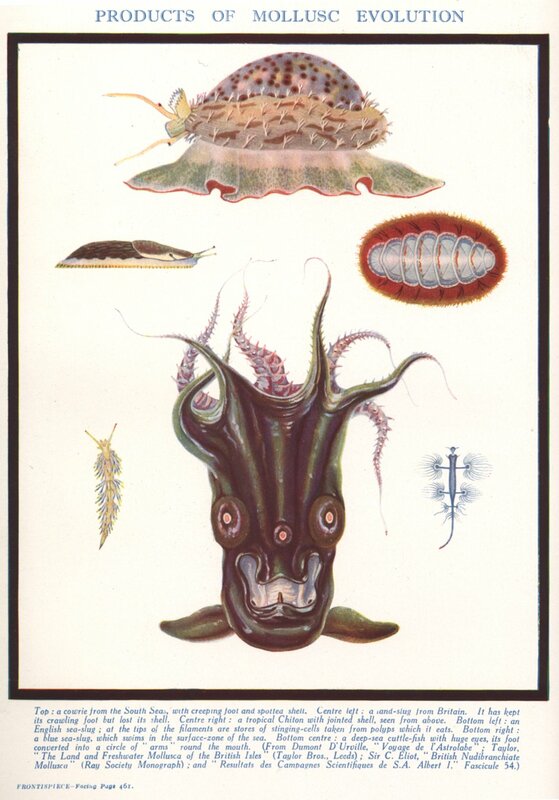 Traditionally seven classes are recognized: Aplacophora (primitive worm-like shell-less forms), Polyplacophora (chitons, these were at one tile included with the Aplacophora), Monoplacophora (primitive ancestral forms), Gastropoda (snails and slugs), Bivalvia (clams, mussels, oysters, etc), Scaphopoda (tooth and tusk shells), and Cephalopoda squids, octopus, nautilus, cuttlefish), of which only Gastropoda, Bivalvia, and Cephalopoda have large numbers of species and a strong fossil record. However it is becoming increasingly recognized that there were more groups that have since died out. Description: The second largest phylumj in the animal kingdom (surpassed only by the arthropods), a highly diverse phylum that includes both familiar animals such as snails and slugs, periwinkles, whelks, limpets, mussels, oysters, scallops, clams, squid, octopus, cuttlefish and many other forms. Although many are distinguished by a hard external shell, others such as slugs and octopus lack any trace of shell. Links: Phylum Mollusca - a good brief introduction to the Mollusks; The Living World of Molluscs - another very good intro, a bit more detailed; Mollusca Tree of Life project; Malacology - from the Australian Museum On-line; Mollusca - a good introduction, from Biomedia (Glasgow University Zoology Museum); Index of Mollusks by Ralph Body - mostly still under construction, although the Aplacophora are well covered; The Classes of Phylum Mollusca - short overview of each of the extant classes; Phylum Mollusca Systema Naturae 2000 / Classification - ; LAB 3 Chapter 8: Phylum Molusca - some lecture notes and images.